Before the Longrow Red Pinot Noir and before the much loved Longrow Red Port, came the Longrow Red Shiraz. It is however not the first in the Longrow line up, that would be the Longrow Red Cabernet Sauvignon. For a full list of the Longrow Red series see our Longrow Red Pinot Noir post. In case you are unfamiliar with the Longrow Red series or with Longrow in general, Longrow is a range of expressions that is distilled at the Springbank distillery. However, unlike the usual Springbank spirit, Longrow is heavily peated and distilled twice (“Springbank spirit” is distilled 2.5 times). 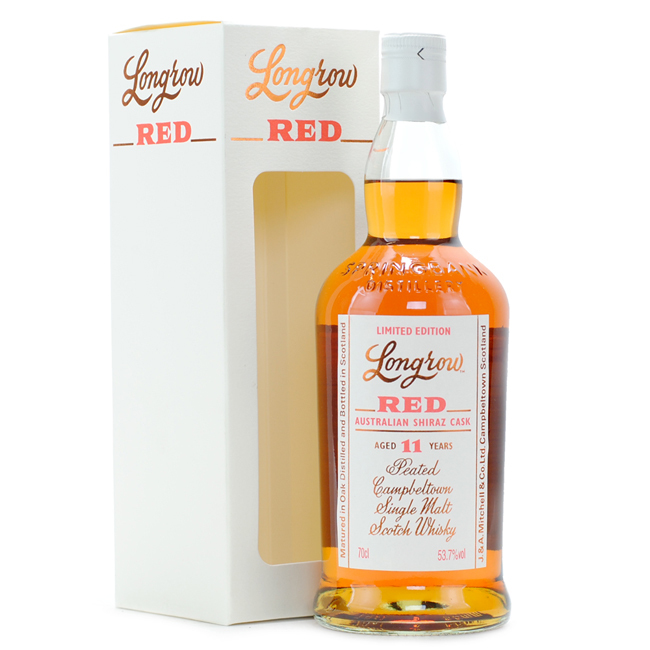 The Longrow Red series contains expressions that were matured partially or fully in red wine casks. Hence the “Red” in Longrow Red. We were both able to try the Shiraz, Port, and Pinot Noir. Despite their almost identical labels, the whisky inside have very different personalities between the editions. The Shiraz is a bright and fruity peaty beast, the Port is a deep sweet peat ponderer, and the Pinot Noir is a quirky rubbery sticky sweet peat pet. I really enjoy wine maturations but I understand there is a contingent of whisky drinkers who wouldn’t touch the stuff. If you are one of them, then I think the Shiraz will probably not be within your flavour profile. However, if you do like wine maturations or are not so offended by them then this is a stellar example that is definitely worth a try. Unfortunately however, the Shiraz is hard to find these days but if you get a chance to try this, I would definitely recommend it. Cask: 6 years in ex-bourbon and then 5 years in Australian Shiraz casks. Heavy peat with bright red fruits. Very nice and herbal peat reminds me of being in a tobacco shop. Beautifully melds with the bright red fruits and berries. There is like a creaminess which bridges the peat and red fruits. Makes me think of eating a strawberry tart while smoking a cigar. Nice lively sweet and sour tanginess. A bit spicy and peppery. Strawberries. Oh big peat slam and then a rush of sweet fruitiness. Strawberries, apricots, rasberries, and a bit of plum. Everything is so well balanced with so much going on all at one. Really a rush for your pallet. Coats the mouth nicely too. That nice herbal peat lasts a long ways. Like the remnants of a cigar. Wowy wow wow. I don’t know if you can tell yet but I am a big fan! This dram just has so much going for it. All those bold flavours are so perfectly intertwined. It’s just a lot of fun to drink. Dried red berries. Cooking marshmallows on a campfire. Bitter cranberries. Starts in peat but mellows out to a bitter sweet. Like sour cherries. Softens to a light kiss of peat and cinnamon spice. I love me some smokey sweet and this does not disappoint. Perfect balance.